While mainstream media sources often seem to downplay the importance of eating organic, more and more people continue to choose it as an alternative to “conventional” food laced with synthetic pesticides. Many people are familiar with the Dirty Dozen and the Clean Fifteen from the Environmental Working Group, a list that highlights the most important fruits and vegetables to buy organic in order to maximize your dollars (of course it’s always wise to buy all organic if you can afford it). But despite the growing awareness of such lists, it’s also important to realize just how contaminated many of the most popular fruits and vegetables in the United States really are these days. The amount of pesticides on these 5 most polluted types of produce is quite staggering, especially when taking into consideration that so many “healthy eating programs” still recommend them or pass them out at health events and omit any mention of the high levels of toxic pesticide residues they contain. Four fruits and vegetables actually have actually been found to have more than 45 different pesticide residues over large samples taken by the USDA; please keep this in mind next time you reach for another “healthy” snack to give your kids in the produce aisle. Topping the list for the second time are strawberries, which may seem healthy at first glance but can actually be loaded with synthetic, toxic pesticides according to the EWG’s research. Pesticides with negative effects on the brain and nervous system have been found in spades on strawberries, with 45 total pesticide residues found by the PDP in 2009. The most contaminated sample in 2017 had 20 different pesticide residues on it, the EWG reported. According to the EWG, the samples of spinach tested contained a bigger pesticide load by weight than any other crop tested, landing it number two on the list for 2017. In total, three-quarters of all spinach samples tested had residues of a particular type of potentially neurotoxic pesticide banned in Europe for use on food crops. Due to its lack of an outer skin, the pesticides soak directly into the crop. Luckily, organic spinach is relatively cheap. While non-organic spinach is even cheaper, it’s not worth it to gamble on your health with a crop as heavily soaked with pesticides as this one. Similar to peaches with their soft, round shape and orange color, nectarines soak up pesticides like a sponge, making it important to always buy them organic or at the very least to limit consumption. According to a 2012 EWG report, nectarines previously had the most overall weight of pesticides of any fruit or vegetable, meaning that you’re probably consuming these dangerous carcinogens in every bite and taxing the health of your liver. Apples are one of the highest pesticide residue fruits out there. Will you think twice about that next apple orchard trip? Perhaps the most notable inclusion on this list is the apple, considering its reputation as a health food, and the lack of organic apple orchards for that matter. 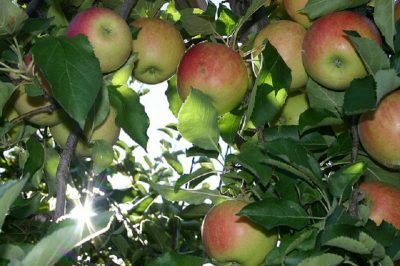 The vast majority of apple orchards remain “conventional,” and yet American apples were recently banned in Europe by regulators. Over 47 pesticide residues were found in conventional apples by the USDA’s pesticide data program in 2010 and the crop is still heavily sprayed today. Doesn’t exactly make for a healthy cup of apple juice now, does it? The soft skin of peaches combined with the amount of chemicals they’re treated with could spell serious trouble for your health over the long term. You can easily find most of these top five most pesticide-laden fruits and vegetables in just about everyone’s kitchen, and that’s what makes them so dangerous to our health when consumed in large amounts over time. Don’t forget to share this information with your friends who still consider these pesticide-soaked fruits and vegetables to be “health foods” and have no idea what this massive pesticide load may be doing to their health. Next articleIs It Safe to Use Aluminum Foil in Cooking?